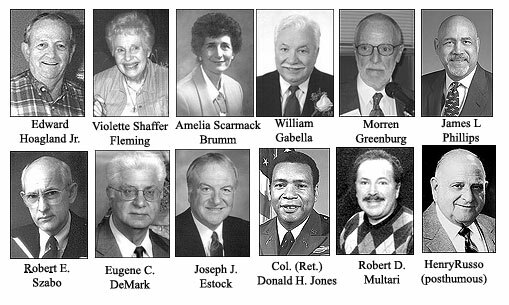 The Hall of Fame board of directors, which is responsible for the selection of inductees and the annual induction ceremony, includes Anthony Aiello, Serena (Tizio) Nevant, Virginia Price, Nicole Smith ,Richard R. Rubano, Dr. James G. Kollar, Russell C. Phillips, Michael Wright and Jim Raykie. The Inaugural Awards Banquet was held on October 21, 2006 in the cafeteria of the Farrell Area School District. The 2nd Annual Farrell Alumni Hall of Fame Awards Banquet was held on October 21, 2006 in the cafeteria of the Farrell Area School District. James A. Raykie Jr., editor of The Herald and chairman of the alumni hall board of directors, served as the master of ceremonies. Edward W. Hoagland, Jr. was a long way from home when he graduated from Farrell High School - in active service with the U.S. Navy. Ed enlisted in May of 1943 and was called into active service on May 14. His mother accepted his diploma for him. He was stationed at several radio schools, and traveled to Pearl Harbor and returned to San Diego. He participated in the Battle of Guam, and returned to Pearl Harbor, where illness kept him in the base hospital for four months. He returned to the States aboard an Army hospital ship, and spent another month in a hospital in Seattle and two months in the Philadelphia Naval Hospital. He was honorably discharged in 1945. He enrolled at Penn State University in 1945 in electrical engineering, and transferred to the Chicago Television Engineering School. After earning a degree, he returned to the area and opened HOMAR Television with partner Joe Marshall. Because of complications of his war illness, he sold his share of the company in 1968 and became director of Veterans Affairs in Mercer County. He served as state president in 1972 and retired in 1982. He has remained an active volunteer for a variety of organizations, especially Meals on Wheels. According to his wife, "Even though he has had great illnesses, he is always there for others, always there for people." He married the former Mildred Marstellar in 1946. They have four children, five grandchildren and five great-grandchildren. Violette (Shaffer) Fleming graduated from Farrell High School in 1943. Her mother, Gertrude Forbes, was the captain of Farrell's girls' basketball team from 1918-1920. After graduation, she spent a summer at the Western Union School, training that led her to one of life's more defining moments. While working for Western Union, she applied for employment with the Federal Communication Commission in January 1945. Because of her background, she was readily accepted for the post in Washington, D.C.
Violette was one of three Teletype operators chosen for the important job of keyboarding the news about World War II, as interpreted and edited from overseas. She worked the 11 p.m. to 7 a.m. shift, and shortly after 2 a.m. on August 14 (V-J Day), she typed the most important message of her career: "Japan accepts surrender terms." As Violette puts it, "Then this job was over and I was out on the streets of our Capitol celebrating one of the most important events in the history of our great country." She lives in Lehigh Acres, Florida, and was unable to attend tonight's annual banquet, but has never forgotten her roots. "I am deeply honored at being selected as a 2006 inductee of the Farrell Alumni Hall of Fame...I am proud to be a graduate of the Farrell High School Class of 1943." Amelia (Scarmack) Brumm, who achieved exemplary accomplishments in military service and as a social worker and author, graduated from Farrell High School in 1949. After graduation, she enlisted in the U.S. Navy and was the first woman from Farrell to volunteer for military duty. After training, she began her Navy career of four years during the Korean Conflict. Upon being honorably discharged, she was awarded the Good Conduct Medal and the National Defense Korean Medal. Four decades after the end of her Navy service, she earned a bachelor's degree in social work in 1989 from Michigan State University in East Lansing, where she makes her home. She is a retired caseworker in family social services, which included being a counselor, student internship and instructor. Before entering Michigan State, she became the wife of Dr. Lynn Brumm and the mother of two adopted children. In addition to her profession, she has volunteered for more than 30 years in both Hermitage and East Lansing. She is the author of a recently published book entitled, "The Voice of the Healer, Then and Now." The book contains the expressions of written prayers described in poetic form. Her hobbies are writing, gourmet cooking, the performing arts, golf, floral arranging and traveling abroad. Lt. Col. (Ret.) W. F. "Bill" Gabella, when he was 17, logged his first hour in a J-3 Cub, and he knew right away what he wanted to do with his life. A retired Army Master Aviator, he served two tours of duty in Vietnam, where he commanded helicopter units. After graduation from Farrell High School in 1948, he took a competitive exam in Erie for the U.S. Naval Academy, scored second highest in northwestern Pennsylvania and was selected as an alternate. The Navy Department encouraged him to enter Purdue University and enroll in the Naval ROTC program as a cadet. He held down three jobs to pay his way through school, and after switching to the Army ROTC program, he graduated with honors in journalism and engineering math. After graduating from Army Rotary Wing School in 1956, he opted out of active duty for the Army Reserves to pursue a Master's in journalism, which he earned from Northwestern's Medill School of Journalism in 1958. He returned to active duty, and his decorated military career earned him three Bronze Stars, two Vietnamese Cross of Gallantry awards, five Air Medals, Army Commendation Medals, Vietnam Staff Service Medal, two Republic of Vietnam Service Medals, Vietnam Campaign Medal, two National Defense Service Medals, U.S. Army Reserve Medal and Meritorious Unit Citation. As a civilian, he received the U.S. Army Chief of Staff's Presentation Medal in 1992 for donation of an emergency sun compass to the Department of Defense for use by U.S. Forces in the Persian Gulf. He is a former chief pilot for Saudi SAR operations and is a Fellow of the Institute of Air & Space Law in Montreal, Quebec, Canada. He earned a law degree in 1987 from the University of South Dakota, and is licensed to practice before the U.S. Federal Court System and state courts in Nebraska. He and his wife Vera split their time between homes in Naples, Florida and Escondido, California. Dr. Morren J. Greenburg is the quintessential Farrell High graduate of the mid-20th century: achieving success professionally and athletically and, perhaps more importantly, living by the belief that it's important to give back to the community. He has lived in Hermitage for many years but is a true blue Farrell native, graduating in 1950. He has made a name for himself as both a physician for nearly a half century and a runner for the last two decades - a list of his achievements would run the length of your arm - but those who know him would say he has earned his esteemed reputation and standing in the community through public service. He has been a volunteer track coach at Hermitage Middle School for 18 years and a member of the Hermitage School Board for the last few years, and, among numerous examples of service, was team doctor for Farrell, Sharon and Hermitage schools. He earned a degree from Youngstown State University in 1954 and his doctoral degree from Jefferson Medical College in 1958. He has been affiliated with Sharon Regional Health System since 1960, serving as the hospital's Chief of Staff from 1987-89. His wife Sherry Fischer-Greenburg is an assistant director at Sharon Regional Health System's School of Nursing. His children are Brian and his wife Cindy, Jeff and his wife Bobbi, Philip, Bob and his wife Kristin, Jennifer and her husband Brad Braverman, and Danielle and her fianc� Rob Snedden. Grandchildren include Johnna, Noah, Jillian and David Greenburg, and Jordan and Madeline Braverman. James L. Phillips, M.D. graduated from Farrell High School in 1950 and has carved a distinguished career in practical and academic medicine. He is the senior associate dean and a professor of pediatrics at Baylor College of Medicine in Houston, Texas, where he has been instrumental in helping the school achieve premier status in the recruiting of underrepresented students in medicine. A skilled athlete and student, he attended Washington & Jefferson College and earned a degree in 1954. He went on to Case Western Reserve University School of Medicine and in 1958 was the first African-American intern at the University Hospitals of Cleveland. His residency in pediatrics was completed at Rainbow Babies and Children's Hospital in Cleveland. After two years at the U.S. Naval Hospital at Camp Pendleton in California, he became the physician-in-chief and chief of staff at the Kaiser-Permanente Medical Center in Parma, Ohio for 16 years. In 1987, he entered academic medicine, serving as associate dean for student affairs and minority programs and associate professor of pediatrics at Case Western before joining the faculty at Baylor in 1993. He is an expert in establishing cultural diversity in post-secondary institutions. At the Association of American Medical College's annual meeting in 2001, he received the Group on Student Affairs-Minority Affairs Section Service Award for outstanding service to medical students, specifically minority medical students, and he was voted national chair-elect of the GSA-MAS. He is married to Barbara Phillips and they live in Missouri City, Texas. He has three sons and six stepchildren. He is active in many community and professional organizations at the local, state and national levels. Robert E. Szabo graduated from Farrell High School in 1952 and enjoyed a long and illustrious career as both a music educator as well as a professional musician. Throughout his schooling at Farrell, he was inspired by Jim Dunlop, Francis Patt and Jim Scanga, and said that Ann Godjic forever changed his life and reflection on the wonders of literature. He graduated from Indiana (PA) State Teachers College in 1956 with a degree in music education and from the Manhattan School of Music in 1963 with a master's of music performance/trombone. While he loved performing - he performed with the New York Philharmonic from 1964-68 and with the San Francisco Symphony from 1968-71 - his labor of love has always been teaching. From his beginnings as a vocal and instrumental teacher at Sharon Junior High School from 1956-60 to his 33-year career at San Jose State University, students have been his priority. Throughout his teaching career at San Jose State, he was the principal trombonist for the San Jose Symphony Orchestra for 30 years. Many of his students have gone on to national and international acclaim, and for 25 years he shared the stage with two of his students in the trombone section of the San Jose Symphony. Both are prominent Bay Area teachers as well. Eugene C. DeMark graduated from Farrell High School in 1953, and while he had a passion for music, he made a name for himself in the design and development of major classified national space-based and ground-based electronic intelligence systems. An accomplished trumpet player, Gene graduated from Penn State University in 1958 with a degree in electrical engineering. While at University Park, he roomed with fellow Hall of Fame inductee Joe Estock and played in the fabled Jim Dunlop's Marching and Concert Blue Bands. For nearly 40 years from 1965 until 2004, he performed executive, program management and systems engineering responsibilities in the definition, design and development of the intelligence systems. They were developed for all of the major United States intelligence agencies. They provided our country and its allies operational intelligence and tactical and technical information superiority over Iron Curtain and Asian adversaries. In 2005, Gene and his family were hosted at the National Reconnaissance Organization and cited along with other founders at the first-ever NRO Recognition and Award Ceremony enabled by the declassification of two of America's early electronic intelligence space satellite programs that were operational from 1962-77. These programs were so critical that they were not declassified until 28 years after they ceased operation. He met Chaye Coral at Penn State, who became his wife of 46 years. They lived in Fort Worth and Long Island before settling in Pine Grove Mills and State College from 1965-93. Since that time, they have lived in the Washington, D.C. area. They are the parents of four children, Elizabeth, Douglas, Carolyn and Geoffrey, and seven grandchildren, most of who live near them in northern Virginia. Joe Estock, who graduated from Farrell High School in 1953, took a circuitous route to a long and successful career as both a music educator and a professional musician. After graduating from FHS, he enrolled at Penn State University as an engineering major but was unable to continue after his first year because of the death of his father in August of 1954. He stayed at home, working at Sawhill Tubular Products, keeping up with his music through activities associated with Marks Music and caring for his mother. She died in 1956, and later that year he re-enrolled at PSU, this time as a music major. Disillusioned with the course of study, he left Penn State after a year, returned to Marks Music as a teacher of woodwinds, and enrolled at Youngstown State, graduating in 1960 with a degree in music education. He earned a master's in music education from Duquesne University in 1965 and a doctorate in woodwind history and literature from the University of Iowa in 1972. From 1965 to 1976, he was chairman of the music department at the University of Wisconsin-Platteville and from 1976 to 2000 was a professor of music at James Madison University, heading the department from 1976 to 1992. Dating from his Marks Music days under the watchful eye of mentor Carl Marks, Jr., he was a freelance musician early in his career, followed by time with the Greenville Symphony Orchestra, Dubuque (Iowa) Symphony Orchestra and the University-Community Symphony Orchestra in Platteville. He received professional training in both the flute and clarinet and plays the saxophone as well. He has numerous professional memberships and affiliations, and his miscellaneous presentations, publications and accomplishments could fill a book. After retiring from James Madison in 2000, he has remained active as a jazz/commercial music performer and as an adjudicator and consultant for higher education arts programs. Col. (Ret.) Donald H. Jones was not only a basketball hero at Farrell High School but a decorated war hero after a stellar college career. Jones graduated from Farrell High in 1957. As a junior in 1956, he led the Steelers to their third state championship, scoring 26 points in the championship game. He was a first-team all-state performer in his junior and senior years for Coach Ed McCluskey and is the greatest rebounder in the history of Farrell basketball and one of its leading scorers. After a brilliant career at Niagara University and graduating in 1961 with a degree in business administration, he was commissioned a second lieutenant in the U.S. Army. His Army career is storied. He commanded a company in the 101st Airborne Division, Green Beret Special Forces Units in Europe and Vietnam; a Mechanized Infantry Battalion in the 2nd Armored Division; the Defense Contract Administration Service Management Area in Orlando; and served the Army's Program for the Mines, Counter Mines and Demolitions programs. For his multiple tours of duty in Vietnam, he was awarded the Defense Special Service Medal, Legion of Merit, two awards of the Bronze Star for Valor, the Purple Heart, three awards of the Meritorious Service Medal, Joint Service Commendation Medal, Combat Infantry Badge, Vietnam Cross of Gallantry and the Vietnamese Courageous Medal. He retired from the Army in 1990 and from the Boeing Company in 2001. He and his wife, the former Sarah Lillian Phillips of Mercer, have three children: Donald, Jr., a high school principal; Darlene, a flight attendant; and Dianne, a criminal court judge. Don and his wife split time between homes in Orlando, Florida and on the family farm in Mercer. Dr. Robert D. Multari, who graduated from Farrell High School in 1968, is a name many people have come to call their family doctor as well as their friend during the last 25 years since he has been in private practice. He spends most of his time caring for his patients at his private practice as well as seeing patients at the Primary Health Network's Farrell Health Center, one of many of their community health centers, along with regular rounds of visiting his patients in the hospital. In addition to his role as a doctor, he has served on numerous boards and exhibited leadership qualities, serving as director of various medical programs. He has earned various honors for his contributions to the medical profession, commending him for being outstanding and caring in his profession. Multari, who graduated from the University of Pittsburgh in 1972 and from the Philadelphia College of Osteopathic Medicine in 1976, spends his spare time being a part of local community events. He is an avid supporter of the Mercer County Humane Society, which among other things provides shelter for large abandoned and abused animals. He is a benefactor of numerous stipends for various Farrell school athletic programs. He grew up in a large family that knew of life's struggles, but strong virtues instilled in him through his parents laid the groundwork for him. He wanted to be a doctor at a young age. Little did he know that the care he provided to an injured black bird, by splinting its wing until it could return to health, would be the precursor of turning a dream into reality. Having his choice of areas in which to work, he chose to return to his small hometown community to share his success and give back to the city and school that meant so much to him since his youth. He is board certified in internal medicine and pain management, and holds several leadership roles in national, state and local medical-related organizations. Henry "Hank" Russo, longtime Farrell fire chief and an avid supporter of community events, is the Hall of Fame's 2006 posthumous inductee. Hank died on December 7, 2005 at 83 years of age. As a life-long resident of Farrell, he left his mark in many ways. He graduated from Farrell High in 1941 and received a four-year scholarship to Duquesne University for football. He played one season and was drafted into the U.S. Army in 1942 during World War II. He was discharged honorably in 1946 after attaining the rank of sergeant and fighting in the famous Battle of the Bulge in Western Europe in December 1944 through January 1945 and was awarded the Bronze Star for valor against the enemy. Upon his return to Farrell, he became close friends with head football Coach Tony Paulekas and worked the chains on the sideline for all games home and away from the late 1940s until the mid-1960s. He was hired as a firefighter in 1951 and served as chief from 1962 until he retired in 1984. He was an active member of the Farrell Boosters Club, serving as president for 25 years. He married the former Enis Pilone on May 4, 1946 and they had four children: Henry, Mary Ann, Patricia and Jeanie. He is a World War II veteran who has been a supporter of the school district for many years. He returned to the area after the war, operated his own business and later served as director of Veterans Affairs in Mercer County, retiring in 1982. Because of illness contracted during the war, he has had 37 different surgeries, but he has continued to be a community volunteer throughout all of it. She was part of a unique and historical occurrence during World War II. She began working for the Federal Communication Commission in 1945 and was one of three Teletype operators who keyboarded the war news as delivered from overseas. She was working the midnight shift on Aug. 14, 1945 when she typed the most important message of her career, informing the nation that "Japan accepts surrender terms." After graduation, she enlisted in the Navy, becoming the first woman from Farrell to volunteer for military duty. She served during the Korean conflict and received the Good Conduct Medal and he National Defense Korean medal. Four years after her honorable discharge, she earned a bachelor's degree in social work from Michigan State University and is a retired caseworker living in East Lansing, Mich. He is a journalist, lawyer and decorated retired Army pilot. He graduated from Purdue University with honors in journalism and engineering math, where he was a classmate of astronaut Neil Armstrong. He earned a master's in journalism from Northwestern University in 1958 and returned to active duty after a stint in the Army Reserves. He served two tours of duty in Vietnam and was decorated with more than a dozen medals, including three Bronze Stars. He earned a law degree from the University of South Dakota in 1987. He has made a name for himself as an area physician for nearly 50 years and a runner for the last 20 years. He earned a degree from Youngstown State University in 1954 and a doctoral degree from Jefferson Medical College in 1958. He has been affiliated with Sharon Regional Health System since 1969 and was chief of staff from 1987 to 1989. He has served as team doctor in Farrell, Hermitage and Sharon. His athletic achievements are many, including induction into the Mercer County Hall of Fame and earning two gold medals and two silver medals at the World Medical Games in Montreal. He carved a distinguished career in practical and academic medicine. He is the senior associate dean and a professor of pediatrics at the Baylor College of Medicine in Houston, Texas. He earned a degree at Washington & Jefferson College in 1954. In 1958 at Case Western Reserve University School of Medicine, he was the first African-American intern at University Hospitals of Cleveland. He was associate dean for student affairs and minority programs and associate professor of pediatrics at Case before joining Baylor in 1993. He specializes in the recruitment of underrepresented students to the field of medicine. He fulfilled a childhood dream of teaching music at the university level as well as performing in a great symphony. He earned a degree from Indiana State Teachers College in 1956 and a master's of music in performance from the Manhattan School of Music in 1963. He performed as a substitute with the New York Philharmonic as a trombonist from 1964 to 1968 and joined the San Francisco Symphony in 1968. He left in 1971 for San Jose State University, where he taught for 33 years and was the principal trombonist for the San Jose Symphony during that time. Many of his students have attained national and international acclaim. He loved music, but excelled in the design and development of major classified national space-based and ground-based electronic intelligence systems. He was an accomplished trumpet player and earned a degree in electrical engineering from Penn State University in 1958. While at Penn State, he played in the Marching and Concert Blue Bands. From 1965 until 2004 he performed executive, program management and systems engineering in the design and development of the intelligence systems, which were developed for all United States intelligence agencies. He earned a degree in music education from Youngstown State University in 1960 and a master's in music education from Duquesne University in 1965. He earned a doctorate in woodwind history and literature from the University of Iowa in 1972. He was chairman of the music department at the University of Wisconsin-Platteville, and from 1976 until 2000 was a professor of music at James Madison University in Virginia, heading the department from 1976 until 1992. He is retired and remains active as a jazz/commercial music performer. He is a man whom many people have come to call their family doctor as well as their friend during the last 25 years that he has spent contributing to his hometown. He earned a degree from the University of Pittsburgh in 1972 and from the Philadelphia College of Osteopathic Medicine in 1976. When he's not busy at Primary Health Network's Farrell Health Center, he spends his time being a big part of the Farrell community. He is an avid supporter of the Humane Society of Mercer County and is a benefactor of numerous stipends for various Farrell school athletic programs. He is the school's team doctor and holds several leadership roles in national, state and local medical organizations. He is the 2006 posthumous inductee and was synonymous with the school district and the community. He received a four-year football scholarship to Duquesne University after playing on Farrell's only undefeated team. He played only one season before being drafted into the Army for World War II. He was honorably discharged in 1946 after attaining the rank of sergeant and fighting in the famous Battle of the Bulge in western Europe for two months in late 1945. He was awarded the Bronze Star. He was hired as a city firefighter in 1951 and served as chief for 22 years from 1962 until he retired in 1984. He was one of the driving forces behind the Farrell Boosters Club, serving as president for 25 years. Among the featured speakers were Schools Superintendent Richard R. Rubano, retired Farrell planetarium director and community benefactor Ted Pedas and master of ceremonies Jim Raykie, editor of The Herald.